This long-anticipated book traces U.S. military involvement in the nation of Panama in the late 1980s through to the invasion of 1989. It discusses the political and historical background to the American intervention, including President Noriega's increasing bullheadedness and his declaration of "a state of war" existing with the USA. Unfortunately, due to sales rights restrictions, we cannot offer 6503: Operation Just Cause for sale in your country. This long-anticipated book traces U.S. military involvement in the nation of Panama in the late 1980s through to the invasion of 1989. It discusses the political and historical background to the American intervention, including President Noriega's increasing bullheadedness and his declaration of "a state of war" existing with the USA. Even before the intervention, Panama was already a major base of operations for the U.S. military, with its troops protecting the strategically important Panama Canal. This book includes a good introductory description of Operation Just Cause, which was launched on 20 December 1989 by around 13,000 American troops. This was against approximately 15,000 troops of the Panama Defense Force (PDF). Amongst many others, Ranger and Airborne troops were used in the attack, many of them being inserted by helicopters. The focus of this volume is on the personnel and weapons that the American troops carried into battle. These elements are presented in carefully chosen photos of this period of combat. The photos represent the various facets of Operation Just Cause, from the pre-invasion days, to the assault, to combat in Panama City, and ongoing operations to stabilize the country. Infantry weapons are very well covered, plus there are numerous photos of vehicles and helicopters involved in the operation. Both the U.S. and the Panamanian combatants are included in the pictures. The book also features four color plates produced by the talented artist, Dmitriy Zgonnik. These plates portray members of U.S. units, including a SAW gunner, a rifleman of the 82nd Airborne Division, and an operator from the 1st Special Forces Group. This informative book is jam-packed with intriguing and inspirational photographs. 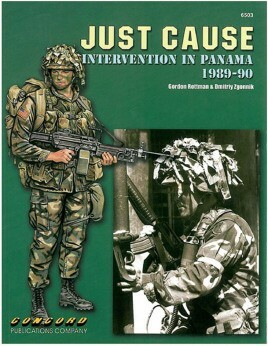 For modelers looking for ideas or those wishing to simply learn more about this "intervention" in Panama, Gordon Rottman's book provides a ready solution!